NETWORK UPDATE: SUPERGIRL stayed at 2.2 in final numbers, and there was no change for BLINDSPOT, CRAZY EX-GIRLFRIEND or JANE THE VIRGIN, either. (For those who care, BLINDSPOT actually outrated SUPERGIRL very slightly, 2.24 to 2.19.) 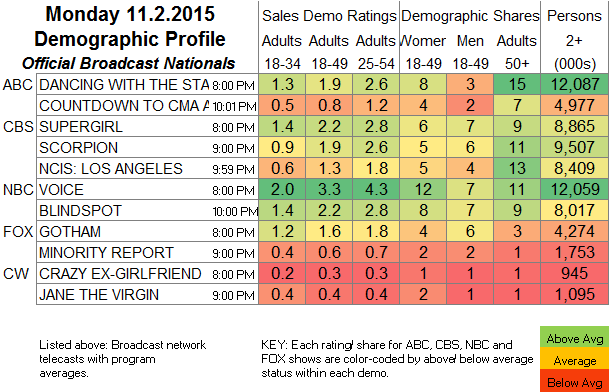 NCIS: LA, however, gained 0.1, as did THE VOICE. Post-football adjustment, DANCING WITH THE STARS lost 0.1, and the COUNTDOWN TO THE CMAS special dropped 0.2. CABLE HIGHLIGHTS: ESPN’s MONDAY NIGHT FOOTBALL was up 0.23 from last week’s game to 4.60. VH1 and USA were as usual in the next slots. LOVE & HIP-HOP lost a tenth to 1.37, and BLACK INK CREW downticked to 0.99. The 3 hours of WWE were at 1.15-1.06, below last week’s 1.28-1.07. Discovery’s STREET OUTLAWS lost 0.05 to 0.78, and VEGAS RAT RODS edged down 0.02 to 0.44. 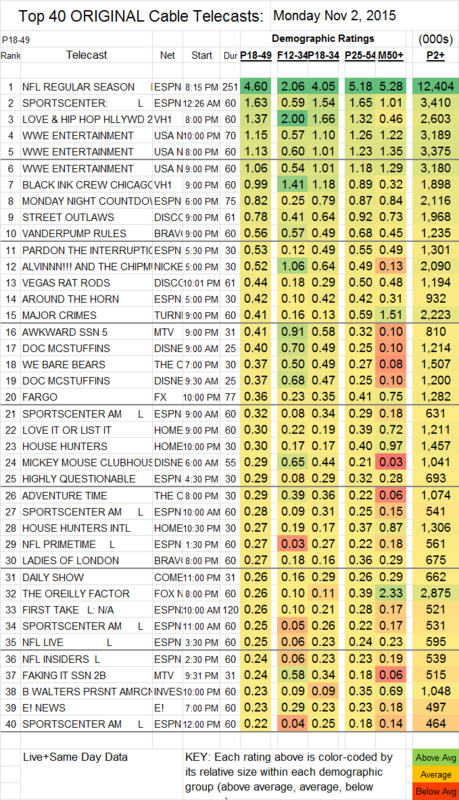 Bravo’s VANDERPUMP RULES returned at 0.56, and LADIES OF LONDON dropped 0.09 to 0.27, with APRES SKI at 0.19. On TNT, MAJOR CRIMES returned at 0.41, fairly steady with Fall 2014’s 0.45 premiere, and then the revamped LEGENDS proved itself unworthy of the trouble that had been taken to retool it with a 0.15 rating. On MTV, AWKWARD was up 0.09 in 18-49s (0.41) and up 0.17 in F12-34s (0.91), the season finale of FAKING IT was up 0.04 to 0.24 in 18-49s (and at 0.58 with F12-34s), then FOLLOW THE RULES debuted at 0.12, followed by GIRL CODE LIVE, which was up a hundredth to 0.09. FARGO (FX) fell 0.06 to 0.36. The PROJECT GREENLIGHT movie THE LEISURE CLASS had its premiere on HBO at 0.08/226K.